What if you had the kind of job where you had to climb 1000 foot structures on a daily basis for employers that care more about money than they do about your wellbeing? The life of a tower climber is not one for everyone. 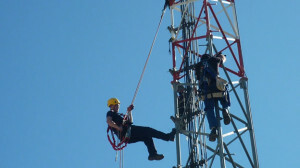 Tower climbers are well aware of the choice they make to climb towers. These brave workers climb on a daily basis, so they are very confident doing their job. This could lead to serious lack of judgment that could result in death. When you get comfortable doing something, anything, there is a chance that you find ways to get results even when the most favorable conditions do not exist. The difference between people who don’t climb towers and those who do, is that any error made in doing their job could be fatal. All this risk exists without adequate insurance. It is yet unclear just exactly what insurance is required by the employers across the board. Insurance reports show that there is hardly any accountability or regulations when it comes to standard requirements for the tower climbing wireless communication industry. There are so many factors involved. I think time is the worst factor because it wears down the mind in an insidious manner. The work environments vary and all are quite extreme. Because of the race to be competitive in the marketplace, cell companies put the pressure on to get the lion share of the cell phone business. This puts pressure on the wireless professionals to perform. Sometimes over worked, tower climbers are moved around from job to job without consideration of the physical requirements. Another factor is location which determines weather conditions which is another factor. Tower professionals usually go out to the middle of no where to work. The bad thing about that is if there is an accident on the work site it could take longer for help to arrive on the scene. When every minute saved or lost can make the difference between life and death, tower climbers should have the security and some comfort knowing that if required everything will be done by the employer to help you. If you are not from a place like California. the time of the year matters. There are some places where it snows or rains profusely. There are many factors at play that when all combined if the necessary precautions are not take, could result in a catastrophic injury. It’s a hard cold fact but the reality is that In the event of a death, employers are thinking of how fast they can replace the worker because in these times tower dogs are expendable. Communications tower construction cell companies are more cognizant and driven by the thinking that regardless of the weather these towers have to be climbed because people are not going to stop using their cell phones. As a matter of fact today people are using cell phones even more. There are more towers being built for the growing number of mobile cell phone users than ever before. That means more money for cell phone companies and more money means more power. It is obvious that these companies are abusing their power because they could use this profit to pay Tower Climbers decent salary and give them adequate insurance. Could it be that instead they use their profit to further perpetuate this cycle of injustice by paying off who needs to be paid off so the gravy train can keep running? It is time for Tower dogs to realize our value, that as the people we might not have all the money but collectively we have the numbers. There are more of us and if we realize this and come together great things can and will happen not just for Tower dogs, which ends up being progress for all mankind alike.